A stunning digital album with new, previously unpublished illustrations, as well as art collected during the development. Complete your arsenal of melee weapons with a powerful Arc whip. NEW: The story “Deus Ex Mechanicus” by Andy Chambers (Andy Chambers) in the Warhammer 40,000 universe. “The dead world Naogheddon is waiting for the priests Adeptus Mechanicus, waiting with its mysterious tombs, lost researchers and deadly defenders of ancient secrets. But the most terrible danger often lies within us ... "
Tehnogorets, unite! The fate of the Empire depends on you! Strategy in the universe of Warhammer 40 000 again calls you on a dangerous expedition, where you will encounter completely unimaginable threats that can wear down even the most persistent fighter who rejected human flesh to the glory of machines. 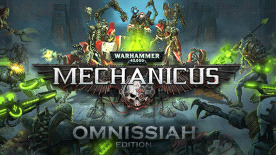 Warhammer 40,000: Mechanicus tells the story of the most technological and enlightened faction of the epic universe. Burn the wrong and tactically calculate the risks that can lead to the failure of an important mission. Learn technology and collect important relics that can lead your army to triumph. Faustinius, fanatically devoted to the followers of the Adeptus Mechanicus, heads the expedition to a new horizon. The newly discovered planet Silva Tenebris keeps a lot of secrets and important artifacts that the Empire wants to have at its disposal. Use the Noosphere and place your faithful fighters on the battlefield to break through the protection of ancient crypts and record all the information in the protocols. You have a huge responsibility on your shoulders for your squad and the ship that was equipped with the latest technology to the glory of the Emperor.